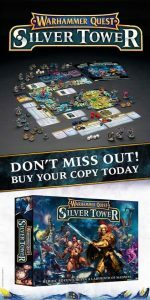 Games Workshop is releasing a new Warhammer Quest: Silver Tower dungeon crawler board game, similar to Descent, but larger in scope and campaign playability. We’ve checked out this game, and it looks like a very strong hack-and-slash dungeon crawler, with lots of strategy, but light enough to appeal to fans of HeroQuest and other old school dungeon crawl board games. If you pre-order or buy Warhammer Quest Silver Tower on the day of launch from Just Games, you may take 20% off any other Games Workshop minis you buy or special order all day long, no limits on quantity. Don’t want a GW mini? Take 20% off any other board game in stock when you buy Warhammer Quest! Special is limited to May 21 only. The game, designed to follow from HeroQuest’s mechanics, will feature a level-up system designed for long-running campaigns, and future expansions will introduce new heroes and scenarios to expand the campaign book that comes in the base game. 40x Exploration (event) cards, to offer even more variation to the game so that each game will be different. The game will be playable by between 2-4 players and will have a variable game length based on the locations/scenarios and players involved. Additionally the heroes and enemies will have rules present in White Dwarf after launch to get them into your regular games. Pre-order your copy at Just Games today, get access to special promos, give aways, and anything else provided by Games Workshop for this event, as well as free entry into our launch day event on May 21, starting at noon. At the launch on May 21 we will open and assemble our games and then get together to play through some of the first scenarios in the campaign. For those who pre-ordered snacks will be provided as we chop our way to the top of the Silver Tower!